Is a very quick method of assigning elevations (Z value)	to contours. Ideal for assigning elevation to contours obtained from	digitizing or scanned vectors. Have you ever wanted to change the highlighted (indexed) contour interval? Or even add an indexed interval? Here's a handy routine that will do that and a whole lot more. Do you ever get tired of the redundant task of creating a Northing/Easting grid for your drawings? Here's a solution that will reduce this pain staking task to a single command which executes in seconds. 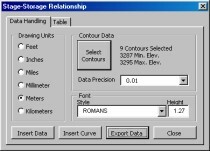 Now here's a quick and simple way to obtain a pond volume and Stage/Storage Relationship. 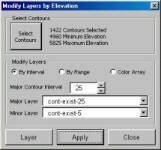 Simply select pond contours and the pond's elevation/capacity properties are calculated. 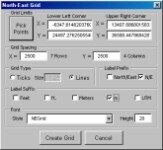 Export to MS Excel, insert table or graph into AutoCAD. 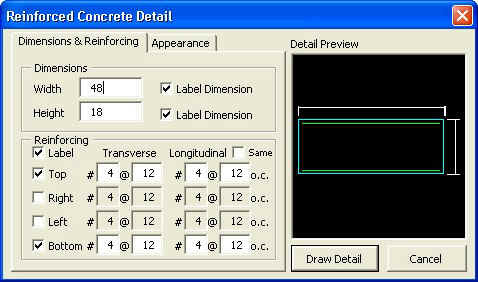 Here is a great time saver if you ever need to draw Reinforced Concrete Sections in AutoCAD. You can quickly develop sections of walls, slabs, beams, etc. Simply specify width and height of the concrete section, enter the reinforcing size and spacing. Creates a 2D detail with rebar call outs and dimensioning. This is handy little routine for easily drawing slopes specified by percent grade, or rise/run. 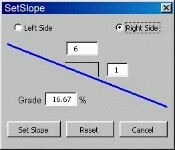 Simply enter the desired slope, and hit "Set Slope" to set your cross hairs on the slope. Run the routine again and hit "Reset" to return your cross hairs to their normal (orthogonal) position.